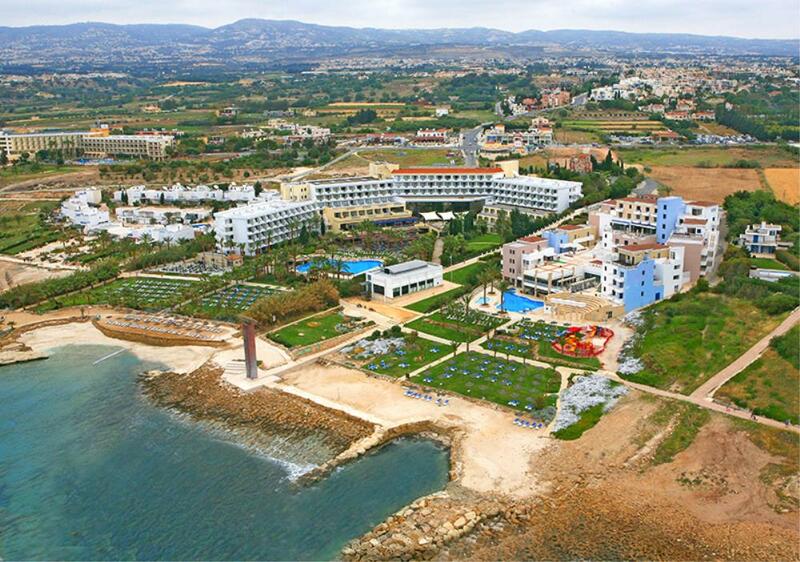 St. George Gardens is located in the eastern corner of the Mediterranean Sea and has become an attractive holiday destination in Cyprus. The friendly and hospitable people, the excellent accomodation and the numberless places of interest will guarantee your pleasant visit. 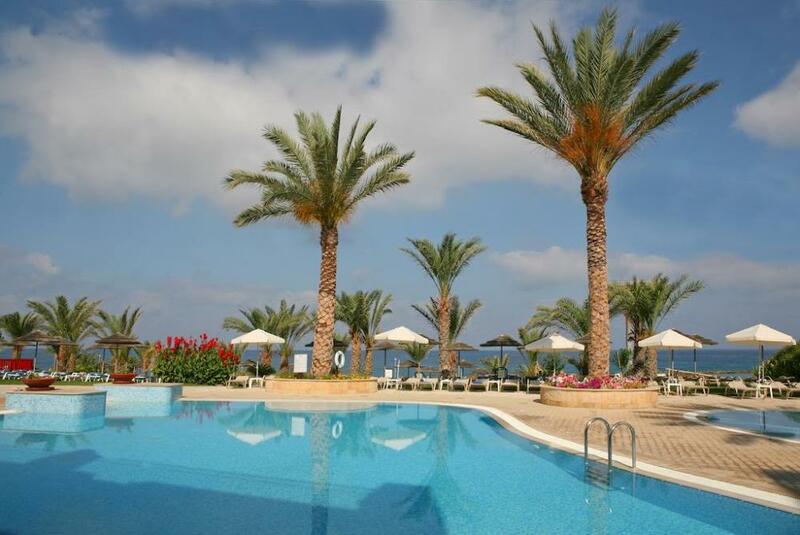 The St. George Gardens are adjacent to the St. Georges Hotel in Paphos and offer a selection of luxurious accommodation including studios and one bedroom apartments. Guests staying at the St George gardens can use the following facilities of the St George Hotel: Jacuzzi, Sauna, Gym & Indoor Pool Only. 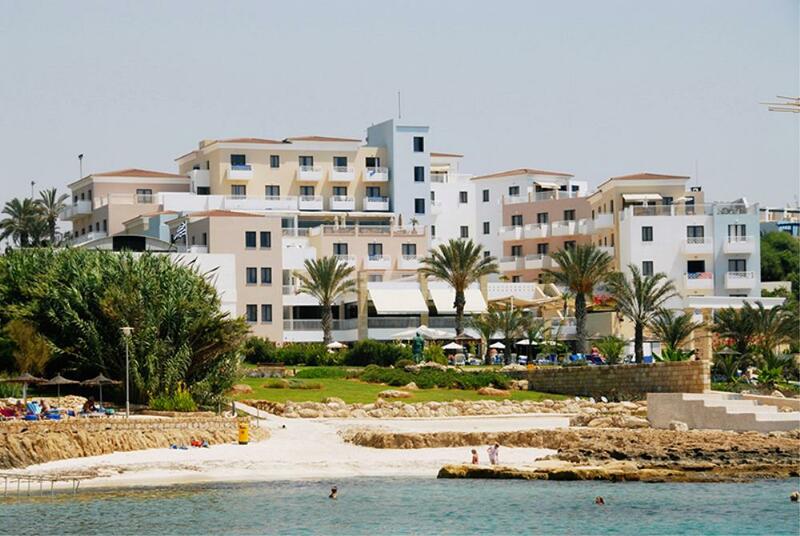 Directly on the beach of Chlorakas, Pafos, the hotels are only 5 minutes from the picturesque harbour of Pafos and 20 minutes from the airport. St. George Chapel and Boat, two historical landmarks of the area, constitute an integral part of the hotel grounds and design. The lobby, enclosed on one side by a glass curtain wall, offers a panoramic view of the sea. The sophisticated hotel interior comprises tastefully designed and fully equipped guestrooms, a choice of first class restaurants and bars as well as various forms of recreation and entertainment for adults and children. The St.George Gardens consists of 88 units – 45 studios and 43 one-bedroom apartments – all fully air-conditioned with a balcony or terrace. It is served at Vasiliko Restaurant. Dinner is served from 19:00hrs to 22:00hrs Buffet style. A rich buffet in pleasant surrounding makes Vasiliko Restaurant a unique venue where breakfast and Dinner is served with pleasure and style. Breakfast is being served from 07:30hrs to 10:00hrs. We are proud to announce that the St. George Gardens Hotel Suites offers you PIZZA CORNER. Pizza Corner is open daily from 11:00hrs at the Empire Pool Bar. You are welcome to join us for some delicious Pizza or Pasta at Empire Pool Bar or you may order Take Away and enjoy it around the pool area or on the beach. 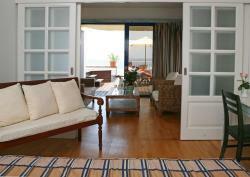 All sorts of sport, games and relaxationfacilities are available for the dynamic and fun-loving guests of all ages. Beauty Hydrotherapy Spa – offering a wide range of treatments including: Exfoliation , Hydrotherapy , Facial Treatments , Packages and Rituals. 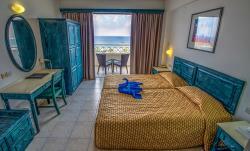 Located on the beach of Chlorakas Village, 5 km from the port of Paphos. Conveniently located, the Minthis Hillls Golf Cours previous (Tsada Golf Club) lies only 15 km from the town of Paphos and is committed to giving the guests of the St. George Hotel priority for games.This long awaited golf course, the first in Cyprus, undoubtedly adds a new dimension to Paphos as a holiday resort. Carefully newly designed by one of the world's leading architects in this field, its picturesque setting offers excellent climatic conditions and a beautiful view of the area all around. 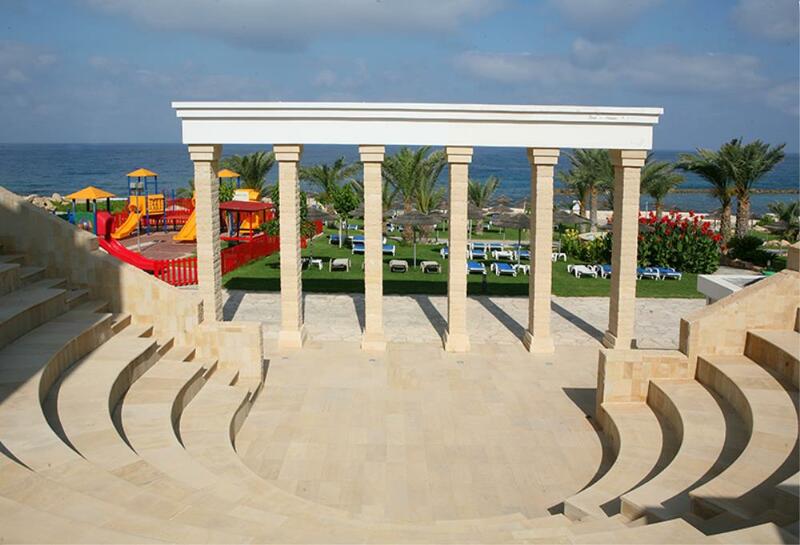 particularly long, at 550m above sea level its elevated location is ideal for a summer game. Body treatments at the St. George SenSpa, where guests of St. George Gardens can use at St. George Hotel. This eastern journey evokes the senses to a land of sun where time moves slowly like dripping honey, where the desert wind is heavy with delicate perfume. This detoxifying journey with its generous ritual allows the body to rid itself of toxins, the skin becomes beautiful and soft, restoring the body to a feeling of well being as in the tradition of the Oriental act of purification. Vent de sable, an exfoliating treatment with a creamy texture, packed with ghassoul, argan oil and seaweeds, gently applied to the body to reveal exfoliated, purified and silky skin. Wrapped in the épices et Algues treatment, the body is detoxified in-depth as the heat provides a delicious calming effect. The massage with ocèan de soleil, a smoothing oil, completes this journey which exudes all the warmth of the perfumes of the Orient. The skin reflects a sumptuous radiance, it is soft and purified and the body feels languorous as if the skin has been caressed by the gentle heat of the sun in one of the medina’s gardens. The Atlantic Coast, a natural source of well-being, the invigorating sea air, the energizing waves crashing on the sea shore inviting you to escape to the endless horizon. Thali’sens has drawn inspiration from this to create a revitalizing ritual which offers the feeling of having just swum in the sea, when the skin has been suffused with the ocean’s essential minerals. The seaweed rich exfoliating powder, grain de mer, leaves the skin feeling incomparably soft and ready to be nourished by the secret d’algues wrap. This green seaweed pulp caresses, revives and tones the skin. When massaged with the au rythme des vagues fluid, the skin tingles with pleasure and feels incredibly soft. Recharged with minerals and vitality, the body is relieved of its tensions and the skin is radiant. Thali’sens transports us to Asia where actions speak louder than words and time for reflection is the order of the day. This holistic treatment will bring harmony to the mind and body. The skin becomes soft and the mind is calm creating a deep feeling of improved well-being. The skin adores the silky touch of the eaux calmes exfoliating treatment which lets the active principles do their work slowly. After this enzymatic peel, the body is wrapped with écume nacrée, which subtly combines tea and seaweeds – or opts for a bath, nestled in métamorphose de l’ eau wax. A sculpting massage with soufflé de satin oil, containing rice bran and seaweeds, is soft and delicate. The mind and body in perfect harmony and sublime, soft and silky skin are an invitation to serenity. A palm tree leaf stirred by a light Tropical wind, a slow pace becomes an art of living, the transparent waters of the lagoon and the languor of the women with long black hair have inspired Thali’sens for a gentle and heady ritual, resembling the perfume of tiare flower. Movement is a caress offering total pleasure which guides us towards a world free of stress and agitation. Tentation crystalline, a delicious exfoliant prepared with coconut pulp and seaweeds, glides over the body to offer it radiance and nutrition. The skin delights in transparence d’atoll wax which becomes a sumptuous massage cream when it melts, like magic, with the turquoise gel, féerie du lagon. As a finishing touch, the ritual used by Tahitian women: the application of an iridescent gold cream, perle de tiaré, which melts into the skin, providing it with incredible softness. To regain strength and dynamism, Thali’sens leads us into a secret world, a dense and luxuriant forest, a land of a thousand enigmatic sounds where all the senses are on the alert. This mysterious ritual speaks of warmth and life and gives new energy to the person receiving it. The seductive texture, the strangely sophisticated perfume of rouge corail exfoliant changes in contact with the skin to provide stimulating sensations. The skin, exfoliated by gentle rubbing, washed free of tension, is perfectly prepared for the profondeur des terres heating wrap. This delightful paste, combining seaweed and cocoa beans, diffuses a gentle heat which favours the elimination of toxins and muscular relaxation. The stimulating sculpting massage with onde boisée provides the finishing touch with Brazil nut tonifying seaweeds. The skin is firmer and exudes an incredible radiance and the body delights in an intense feeling of exhilarated well-being.